Describe in general terms how cancers develop and be able to describe the hallmarks of cancer. Describe the step-wise progression from normal to pre-malignant to malignant histology and how this relates to the principles of screening and early detection. Demonstrate an understanding of how hormones influence development of certain cancers and how this may help direct management. Describe the important genetic/familial syndromes related to cancer development, identify their mode of inheritance and impact on cancer development. Describe how common carcinogens can cause cancer (e.g. cigarette smoke, asbestos, UV radiation, radiation exposure). Describe how common infections can cause cancer (e.g. viral hepatitis, H. pylori, EBV, HPV, HIV). Define the terms metaplasia, dysplasia, carcinoma, sarcoma, lymphoma, leukemia, and germ cell tumor. Demonstrate an understanding of the role of different specialists in obtaining tissue diagnosis of cancer (ie. family physician, radiologist, surgeon, oncologist). Describe the most common patterns by with cancer spreads (ie. direct extension, lymphatic, hematogenous, transcoelemic). fine the terms metaplasia, dysplasia, carcinoma, sarcoma, lymphoma, leukemia, and germ cell tumor. Demonstrate an understanding of relevant anatomy for common cancers (ie. prostate, breast, lung, and colorectal) in terms of how they invade and metastasize, with an emphasis on invading adjacent structures, spread through the lymphatic and vascular systems. Cancer is a disease where cells lose normal growth regulation, proliferate abnormally from their normal counterparts, and invade other tissues. Often, it is not a single disease but a collection of multiple cellular abnormalities. Cancer cell behaviour is differentiated from normal cells by four characteristics (Table 1). These four characteristics may actually exist in normal, non-cancerous cells. However, this dysregulation is inappropriate and excessive in cancer (1). Additional hallmarks exist to further specify the types of cellular dysfunction from the four characteristics above (Figure 1). Many terms exist to classify cell dysregulation and can describe how cells can develop into cancer. It is important to note that not all these terms are synonymous with the disease of cancer itself (Table 2). The terms benign and malignant describe a property of cells which have abnormal cell growth and proliferation (Table 3). Both terms refer to cells which have lost normal regulation of cell division and death. However, only malignant cells possess the ability to spread and invade other tissues. In most literature and in this module itself, several equivalent terms will be used interchangeably. Tumor and neoplasm both refer to abnormal, unregulated growths of tissues. Malignant tumor, malignancy, and cancer all refer to the invasive nature and disease of abnormal, unregulated growths of tissues. Genetic abnormalities cause the vast majority of human cancers (1). Mutations in genetic material are caused by variety of etiologies such as damaging radiation, exposure to carcinogens, or failure in proof-reading mechanisms. These abnormalities result in loss of regulation over cell growth and proliferation. Abnormal cell growth behaviour is often reversible (Table 4). That is, they are caused by a stimulus and are ceased when the stimulus is removed. Pre-malignant changes in cells are referred to as dysplasia, and is seen as dysfunctional cell growth and morphological changes in cell nuclei (2). Dysplasia results in cells losing specific characteristics from their tissue of origin. This loss in cellular differentiation is classified as grades (low, medium, and high) where lower grade neoplasms resemble their tissue of origin better than higher grade neoplasms. It is important to remember that dysplasia are not necessarily cancers; they simple describe the growth pattern of a neoplasm, which can either be benign or malignant. Metaplasia is the reversible replacement of one cell type by another (2). Like dysplasia, metaplasia are not necessarily cancers and may be reversed upon removal of a certain stimulus. One example of a benign metaplasia is the transformation of respiratory epithelium from columnar to squamous type due to chronic irritation like smoking. Transformation of normal to pre-malignant to malignant cells follows a course of step-wise histological changes (Figure 2). In epithelium, normal cells initially undergo low to medium grade dysplasia due to a stimuli such as a genetic abnormality. This initial dysplasia does not involve the entire epithelial height and is not cancerous. It can either revert back to normal or progress to high grade dysplasia. 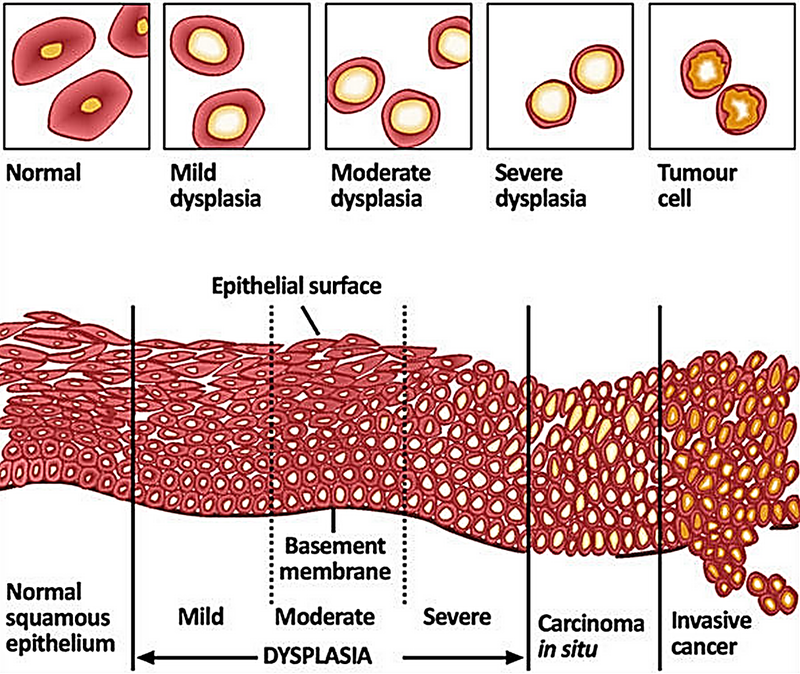 Should it progress, the dysplastic cells can involve the entire epithelial thickness and accumulate to push against the underlying basement membrane (Table 5). Penetration through the basement membrane would allow the neoplasm to invade other tissues, thus deeming it cancerous. By these definitions, dysplastic cells are not malignant and cannot disseminate to other tissues until the basement membrane is broken. Thus, carcinomas in situ are not malignant and are technically benign neoplasms. However, carcinomas in situ are automatically high-grade dysplasia and its cells have the potential to become malignant. Consequently, most carcinomas in situ eventually progress to malignant carcinoma. Hormones act as stimuli which influence cancer development in tissues such as the breast, endometrium, ovary, prostate, testes, thyroid, and bone. Endogenous and exogenous hormones regulate cell growth and proliferation at normal levels. Increased hormone levels can lead to excessive cell proliferation which can accumulate genetic abnormalities (3). Breast cancer is the most common cancer in women, and is driven by hormones. Germline mutations in breast epithelial cells, such as those in the BRCA1 gene, predisposes cells to genetic mutations (3). Estradiol (or estrogen) produced in the ovaries further drives cell proliferation and following the cell proliferation model, leads to an accumulation of genetic abnormalities. Eventually, these abnormalities produce a malignant phenotype consistent with breast cancer. Hormone driven cancers can be managed by controlling endogenous hormone levels. Hormonal anticancer pharmacotherapy is currently a major method of control. Examples include hormonal antagonists to block target receptors, or hormonal analogues which mimic hormones and induce negative feedback reduction of hormone production. Pharmacotherapy can also block enzymes in hormone synthesis pathways such as aromatase inhibitors required for estrogen production (3). Surgical removal of the hormone-producing organ is the final option in hormone therapy. Thus, hormone therapy is a specific form of treatment and can be used to predict treatment success in certain cancers. For example, estrogen and progesterone receptor statuses direct the management algorithm in breast cancer. Various molecular markers exist to indicate the presence of cancer. These markers mainly aid diagnosis and assess prognosis (2). As well, the presence of certain markers offer insight into possible treatment. For example, hormone epidermal receptor 2 proteins (HER2) are present in approximately one-fifth of breast cancers (6). Family history is a major determinant of risk for developing and having certain cancers. However, it is interesting that only five percent of cancers have hereditary relationships. The two-hit hypothesis explains the increased genetic predisposition in patients with a positive family history. Various genes exist in the body to suppress cancer development. One example is a type called the tumor suppressor gene. Recall that genes in a cell exist as two copies (two alleles) with one copy from each parent. 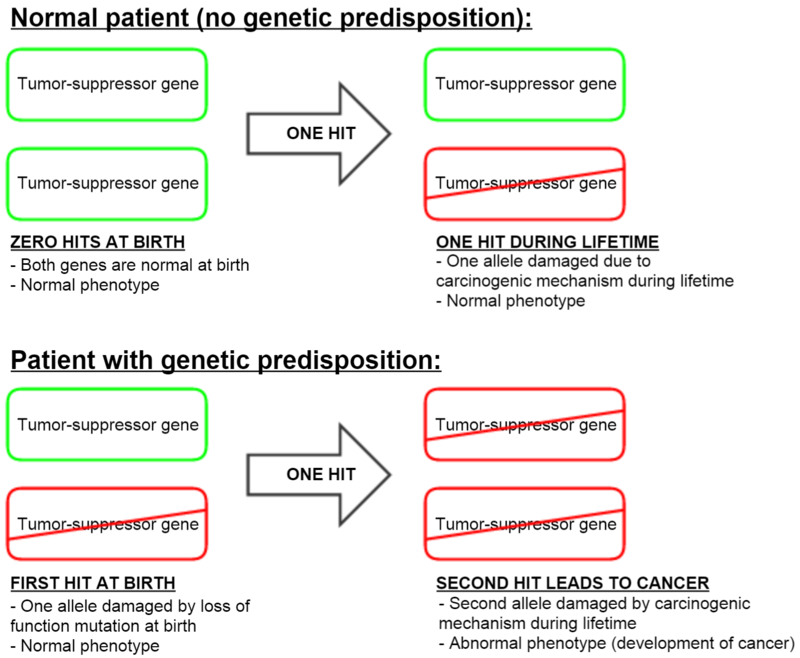 Thus for a cancer to develop, two hits are required to compromise both alleles and cause cancer. Patients with a hereditary syndrome have one hit already, and are born with only one normal allele. They are predisposed to cancer since they only require one additional hit to result loss of both genes. Carcinogens are substances which induce malignancy by altering normal cellular genetics. They can be classified in three general categories: chemicals, radiation, and viruses. Chemicals and radiation cause biochemical damage and alterations to normal DNA. Common chemical carcinogens include cigarette smoke and asbestos, and common radiation carcinogens include UV radiation from the sun and radiation therapy. Viruses act differently by introducing new genetic material to a cell. The new genetic material may alter existing genetic material leading recombination which may be malignant (5). Staging and grading of cancers are different classification methods. The grade of a neoplasm refers to the histological and pathological features of the cells in a neoplasm. Recall that dysplasia is the abnormal proliferation of deregulated cells. As dysplasia develops, the neoplastic cells lose features of their tissue of origin, become less differentiated, and are presumed to be of higher grade. The stage of a neoplasm provides a sense for how advanced a cancer is. Many (but not all) cancers are staged using the TNM staging system. This system is divided into three components: the tumor (T), nodal status (N), and metastasis (M), universally called the TNM staging system (Table 6). The TNM status will be different for each patient depending on their tumor and cancer. Different combinations can further be classified into general stages I, II, III, IV. We stage cancers for the following reasons: it provides a common language of communication, guides treatment, estimates prognosis, allows comparison of results, and standardizes clinical trials. Stage I cancers are early cancers that are often curable. Stage IV cancers are usually incurable. The TNM and staging differ for each tissue of origin and thus, specifically predict the management and prognosis of individual cancers (2). Confirmatory diagnosis of cancer often requires direct histological analysis of tissue. Obtaining a biopsy is the process of removing and examining tissue, and is performed through various methods. With cancer, suspicious regions of tissue are often biopsied for analysis; these could include abnormal lumps or regions identified by imaging. Fine needle aspiration biopsy uses a fine needle and syringe sample a tissue. Negative pressure through suction provides the force to remove the tissue. Deep tissues such as the lungs or liver may require radiological guidance. Biopsies with simpler imaging modalities such as ultrasound may be performed in a non-specialist’s clinic. However, more complicated procedures may require a radiologist or trained surgeon in the hospital. Superficial tissues such as the prostate or breast do not require additional guidance (7). Core biopsy uses a larger cylindrical needle and extracts cylinders, or cores, of tissue. This provides a larger sample of tissue to analyze than fine needle aspiration biopsies. Similarly, simple procedures may be performed in the office setting by a non-specialist (7). Surgical biopsy involves extracting large amounts of tissue. There are two types of surgical biopsy: incisional and excisional. Incisional surgical biopsies removes parts of abnormal tissue, similar to fine needle and core biopsies but in a larger amount. Excisional surgical biopsies removes the entire abnormal area or tumor, and may additionally excise normal tissue around it. Excisional biopsies may very well be curative intents to remove affected parts of an organ or the entire organ itself, with tissue analysis following the excision. Surgical biopsies are typically performed in the hospital with local or general anesthesia depending on the extent of analysis (7). Benign tumors grow slowly, resemble the tissue of origin, and do not invade other tissues. Thus, benign tumors are localized and can be cured by removal. Some benign tumors may develop into malignant tumors (cancer), which grow much faster, do not resemble the tissue of origin, and invade other tissues. Malignant tumors metastasize and spread to other parts of the body, making them more dangerous and less curable (2). Cancer spread is classified into three mechanisms: local, lymphatic, and hematogenous spread. The TNM staging mimics these three patterns of spread. Local spread is the spread of a cancer within an organ or structure. The cancer is still considered malignant since it has likely broken the basement membrane and has disseminated within intra-organ passages. The tumor may now exist as a direct extension of the original tumor, or appear as multiple, discrete tumors throughout the organ (2). This corresponds with the T stage of the TNM. Recall that the lymphatic system is a network of circulatory vessels to collect and redistribute excess fluid in the body. Superficial channels in the skin and subcutaneous tissues drain into deeper channels which ultimately collect into large ducts that drain into the vascular system. Along the way are lymph nodes, which are accumulations of lymphoid tissue, which play a role in the immune system. Lymphatic invasion correlates with the N stage of the TNM. Cancers often disseminate into the lymph pathways and follow the drainage of lymph into lymph nodes. This may allow detection and localization of cancers through physical exam, as cancerous lymph nodes are often hard, tender, and matted-down. 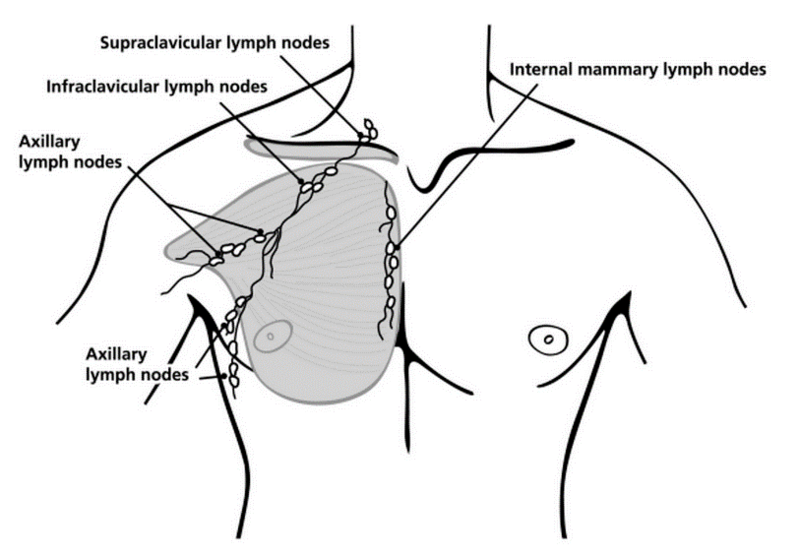 For example, cancer in the outer breast spreads to ipsilateral axillary lymph nodes, while cancer in the inner breast spreads to the internal mammary chain lymph nodes (Figure 4). Hematogenous spread of cancer follows the vascular circulation of blood. Metastases from organ to organ almost always requires hematogenous spread. Cancers may simply follow the path of circulation, such as gastrointestinal cancers spreading to the liver via the portal vein. However, cancers may also directly invade a vessel such as a renal cancer spreading into the renal veins. Tumors often invade veins but rarely invade arteries (2). Isselbacher K, Harrison T. Harrison’s principles of internal medicine. New York: McGraw-Hill; 1995. Shah A. Essentials of clinical oncology. Vancouver: Somerset Pub. ; 2004. Henderson B. Hormonal carcinogenesis. Carcinogenesis. 2000;21(3):427-433. Schwartz S. Principles of surgery. New York: McGraw-Hill, Health Professions Division; 1999. Murray R. Harper’s illustrated biochemistry. New York: McGraw-Hill Medical; 2012.